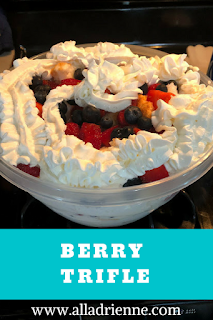 This Berry Trifle is my go to for summer holidays. It is light, easy, and delicious. It is always a hit with our families. It is perfect for summer, holidays, and when wanting to eat healthy. 1- Layer bottom of dish with 1/2 of the angel food cake. 4- repeat with rest of angel food cake, and berries. 5- Finish off with remaining whip cream. 6- Refrigerate for 3-4 hours, until ready to serve. *** I use a Rubbermaid bowl as the dish, you can also use a cake dish. We are planning to go strawberry picking so maybe I will make this!